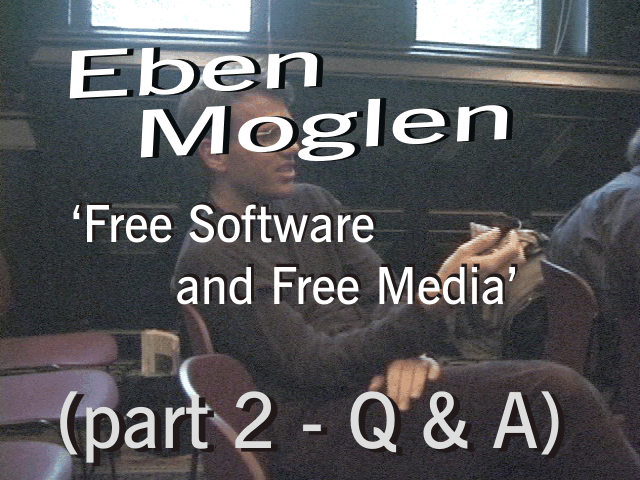 The Metropolitan NY Chapter of the Internet Society continued its popular series of seminars at the Jefferson Market library in Greenwich Village with a session with Eben Moglen, a Columbia U. law professor better known as the general counsel of Richard Stallman's Free Software Foundation. Ever ebullient and optimistic, Prof. Moglen argues convincingly that natural law, moral humanism, and basic economics, all together imply the eventual victory of the free (as in freedom) software tortoise over the scheming corporate oligapolistic hare, and is very entertaining as he does it. We have 2 parts here - the basic presentation, and then the Q&A. A transcript can be found here. The OGG video above is Theora encoded. The h.264 is iPod compatible. Both are playable with the VLC player. You may have to paste the h.264 link directly into VLC to get it to stream. There is a DVD of this talk, you can obtain a copy from orders@pinstand.com for $5 inc mail (Paypal accepted, $6 foreign). 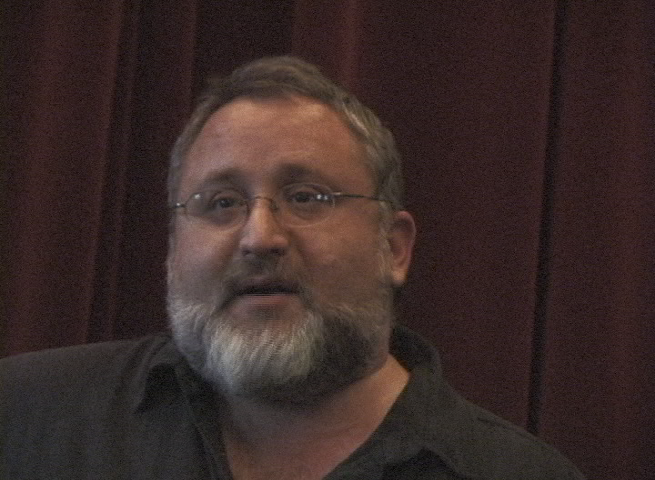 Hear Eben Moglen on the same themes in May 2002 on PUNKCAST#156. Also, Richard Stallman can be heard and seen on PUNKCASTS#64 and #905. I apologise for the bluish tint on this one - caused by me forgetting to switch the camera to daylight settings - I'm used to shooting bands in dingy basements, what can I say? 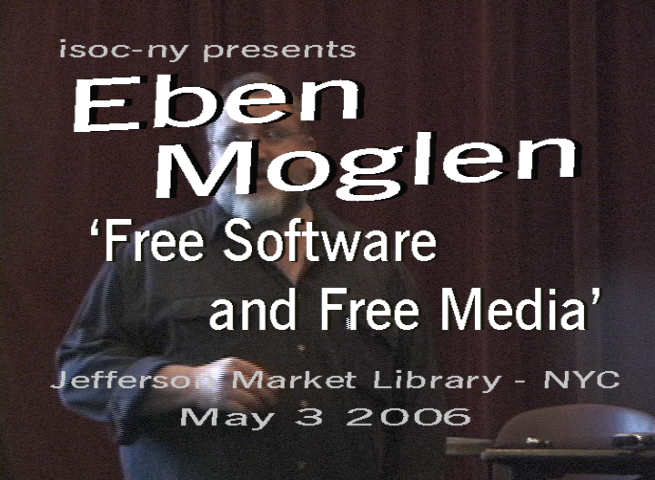 All Visual and Audio content is Copyright (C) Eben Moglen. Permission is granted to copy, distribute and/or modify the content under the terms of the GNU Free Documentation License, Version 1.1 or any later version published by the Free Software Foundation; A copy of the license can be found here.